The latest Nike SB M-65 jacket was designed by infamous Bones Brigade member Robert Lance Mountain (also believed to be one of the inventors of the finger board ha). The jacket is really quite eye catching. 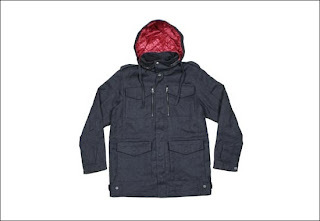 The outer consists of black heather hemp accented by a ruby red polyester lining and cargo pockets and also features a packable hood. Retails for $238 USD.